Born in Ray, Arizona (though registered in Phoenix, AZ) he was one of the first Hispanic Americans to enter lucha libre when it was initially brought to Mexico. At age 4, Gori moved to California and attended school until he turned 13. A year later he and his family returned to Mexico and moved to Guadalajara, Jal., where he used his English language knowledge to work as an interpreter in a pottery shop at Tlaquepaque. There he studied bilingual commerce as well. Gori's parents were both Mexican born, from Las Huertas de Nochistlán, Zacatecas, but as they were a big family (9 children) he couldn't continue studying, especially considering that their mother died at the very young age of 30. While in California, young Gori worked as a paperboy and he also sold Mexican bread, and while in Mexico he had a job in an hotel as a bell boy. During his youth, Guerrero liked all sports, so when in Guadalajara he had the chance to train for free at a "Box y lucha" club, he didn't think about it twice - he wanted to be a boxer. However when he went there to sign for his boxing training, he saw some people training for lucha and he quickly changed his mind - now, he wanted to be a luchador. The two men that trained him professionally were two local wrestlers called Diablo Velasco and El Indio Mejía. After two weeks of very basic training (even though Velasco would later on become one of the most prestigious lucha trainers ever, Gori said that back then they were basically clueless) he had his first match. He wrestled for a small, but highly respected promoter called Jim Hernandez on September 14, 1937, at the Arena Nilo from Guadalajara. That night, the 16 year old Gori got defeated by Raf "El Rojo" and earned 15 centavos. Gori impressed many people because he had a well worked body (he loved to spend hours in the gym) and was a fast learner. He continued wrestling in small arenas and had his first feuds against Zandokan, Chimal Galón and Firpito Bustos. Soon, he became friends with a veteran wrestler called Gilberto Martínez Larrea, who took him under his wing and taught him many secrets of lucha and several "shoot" techniques just in case a match would get out of hand and his opponent tried to hurt him. He also established a friendship with a wrestler called Raúl Romero who introduced him to amateur wrestling, which helped turn the the young untrained kid into the technician marvel. 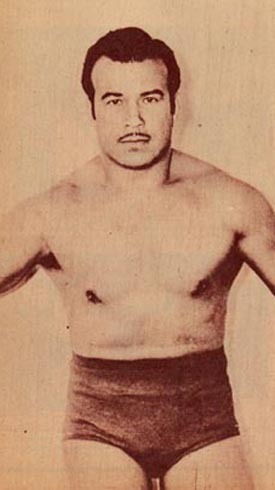 Gori got signed by EMLL and made his Arena Mexico debut on January 3, 1943. A year later he was given the "rookie of the year" award by the media, quite an interesting fact considering his debut date, and that in Mexico usually only real rookies get those awards. Now he was in the spotlight and his popularity was rising fast, so he was given his first title. On April 20, 1945 he defeated the legendary foreigner Jack O'Brien to get the National Welterweight Title, which he vacated just five days later, probably due to weight reasons. It wasn't too late when he got another title though, as on September 25, 1945 he defeated Bobby Bonales for the National Middleweight Title. Gori defended that title successfully until the 31st of May of the following year, when El Santo defeated him in a title match. During the late 40s and the early 50s, his feud against Cavernario Galindo started some of the bloodiest battles of the history of pro wrestling. Even though blood had been already seen in the Mexican rings, they were the first ones to have a series of bloodbaths in lucha, and it is thought that their feud was the first bloody one in the whole world too. They would let lose the blood from each other's head in liberal amounts and the concept became so popular that promoters all over Mexico "stole" the idea. As if that wasn't enough, they decided to raise the bar even more as the singles feud became a tag team feud: La Pareja Atómica (The Atomic Pair) of Santo and Gori headlined dozens of cards against Cavernario and Black Shadow, and you could be sure that after the matches all four wrestlers' face and chest would be covered by their own blood. Gori got several more titles during his career, and later he would have a series of matches against one of his first wrestling idols, Carlos "Tarzan" López, whom he'd defeat to gain the NWA Middleweight title in 1946 to get his first "world" title. Other of Gori's great rivalries was against the Jamaican high flyer Dory Dixon. The latter is considered by many the most important feud of 1965. Guerrero's matches against Bobby Bonales are considered classics as well. The match in which Gori lost the NWA Welterweight title to Bonales lasted 1 hour and 50 minutes. Gori also had a memorable Arena Coliseo match on November 16, 1954 against the reigning NWA World Heavyweight Champion, the great Lou Thesz. Thesz lost but it was a great match. Both men really respected each other's abilities and whenever one of them talked about the other one, it was always to say good things. Like Santo and many other wrestlers of his generation, Gori eventually left EMLL and became a free agent, as that way he could earn more money and he could choose working for whoever he wanted, whenever he wanted. On December of 1966 he was stripped of the NWA World Light Heavyweight title, though Gori kept the actual belt until 1972 and defended it outside Mexico against legends of the caliber of Danny Hodge and "Dangerous" Danny McShain. He and his family then moved to Cd. Juarez, and Gori reduced his schedule only picking dates in Los Angeles (where his son Chavo was the booker for a while), El Paso, Texas, Tijuana and Juarez itself. Gori's last title reign was when he and Chavo were 1-day NWA Americas Tag Team Champions in L.A. They defeated Senior X and Karl Von Brauner on February 27, 1976, and lost the titles the next day against the Spaniard Crusher Verdu and Roddy Piper. In Mexico he'd mainly wrestle for the Tijuana-based Mora y Asociados, also known as the WWA or Promociones Mora, and he teamed more than once with his old friend El Santo. He kept wrestling less due to his age, but he never left the business. He became a wrestling trainer and a promoter in the El Paso, TX and Cd. Juarez areas. After Dory Funk Sr.'s death in 1973, the whole Texas wrestling scene changed and as those changes hurt Gori's promoting he stopped his Texan promotional affairs and only promoted in Mexico. Starting from March 1975 he'd run shows every Sunday at the plaza Alberto Balderas from Ciudad Juarez and he used young wrestlers he trained (with help of his son Chavo) like Juan Limón, Zombie Palacios, Criminal; his sons Hector and Chavo, his nephew Javier "Gusano" Llanes, a few local wrestlers (both male and female) and when he had the chance he also used Golden Rogers, Buddy Rogers Jr. and his old friends/enemies Dory Dixon and El Santo. He eventually quit promoting and just wrestled a few times a year until the early 80s when he retired from all wrestling activity. Gori died in his home of El Paso the 18th of April, 1990. Gori is one of the pioneers and masters of lucha libre. His impact in lucha is really important as not only he created holds such as "la de a caballo" (camel clutch) or the Gori Special (hanging backbreaker submission hold), but also was a key player in making popular the agressive technician style that later other wrestlers like Rene Guajardo or El Signo would show. He was a legitimate tough man and his legacy is still highly respected by the young generations of lucha libre fans, as Gori was the patriarch of one of the best families of wrestling workers ever in the business, and several of those wrestlers are still active. This page was last edited on 16 December 2017, at 21:18.